thinking with my fingers: Can I still buy Lego? Hear, hear. The whole thing has made me deeply cross and sad, and far less inclined to buy Lego for any future children than I otherwise would have been. "and yes, a kitchen in bright colours would be cool, but can't it fit in right next to the command bridge on the death star?" The great thing about legos, at least in my experience, was the way everything fit with everything else. Dump them all together and make something new and it didn't matter what set they came from. This changes that, and for no apparent benefit. Beside that, I'm not a fan of the "pink means it's for girls" concept. That looks like a science lab, which would be great for male or female, just by using normal colors and having a variety of head choices. 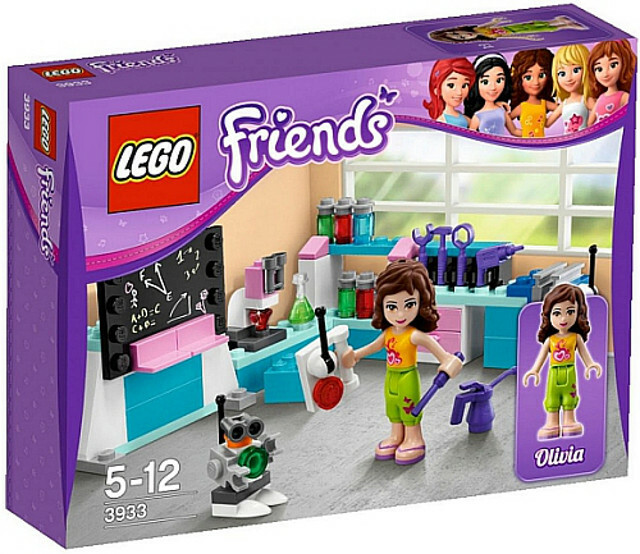 Lego have had their very pink girl-series Belleville for ages. I can't understand the ramblings now about them all of a sudden going gendered. Besides - my daughter (age 7) loves the buildings from the Creator-series. And the Castle-series - where she can play with queens and princesses. And when my boy gets a bit older (just turned 4), I can't see why they can't play together - with all the things for Lego City: she with pizzaplace and houses and families, and he with the airport and policestation) or Lego Castle: she with the village and mill and queen and maids; he with the knights and robbers from the forest. I suspect the "all of a sudden" buzz has to do with the most recent Lego campaign. For instance, have a look at this blogpost from Sweden. For English speakers, it's the post of an outraged mother who received a promotion box with four pastel coloured legos and the claim that the new girl-orientation of Lego is closer to reality. And of course the kids manage to play together - my kids made movies with teddy bears and dolls doing karate moves and attacking each other with baseball bats and other sports gear. Children manage to cross and mix the expectations of culture in wonderful and unexpected ways. Lego is however not a random universe of everything possible in a toy-box. It's a planned and designed universe, where gendering is increasingly obvious. They have, to a certain degree, designed themselves out of the gender neutral image it had, and into a corner where they have lost almost half their potential customer base. And they try to fix that by increasing the gendering along extremely stereotype paths, rather than reinventing the earlier gender neutral middle ground. This is not a criticism of childrens' ability to circumvent the plans of designers, it's a criticism of increasingly gendered design and how it steers our expectations of childrens' desires and behaviour. It even shows in your comment: you expect the girl to be able to play with the boys' police station and airport - you are projecting a gendered idea about what toys they will enjoy, for your boys as well as the girl. And this gendered design comes back in everything for children: Clothes, bicycles, backpacks, sportsgear. Skis are for instance something that really should be passed from the older to the younger, as they never last more than one season. But with the extreme gendering of sports gear, if you have children of different genders, that becomes problematic, as boys and girls have learned the lesson of blue and pink very well. And as long as nothing is red, green or yellow - or any other gender-neutral colour - parents give in to the need to buy new gear for the child of another gender, to save their children from peer pressure and ridicule. 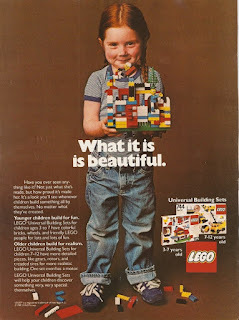 Lego might have had the Bellville series for ages - but they have kept it carefully apart from the main Lego brand (as you will see if you check the Lego homepage), perhaps for a very good reason. 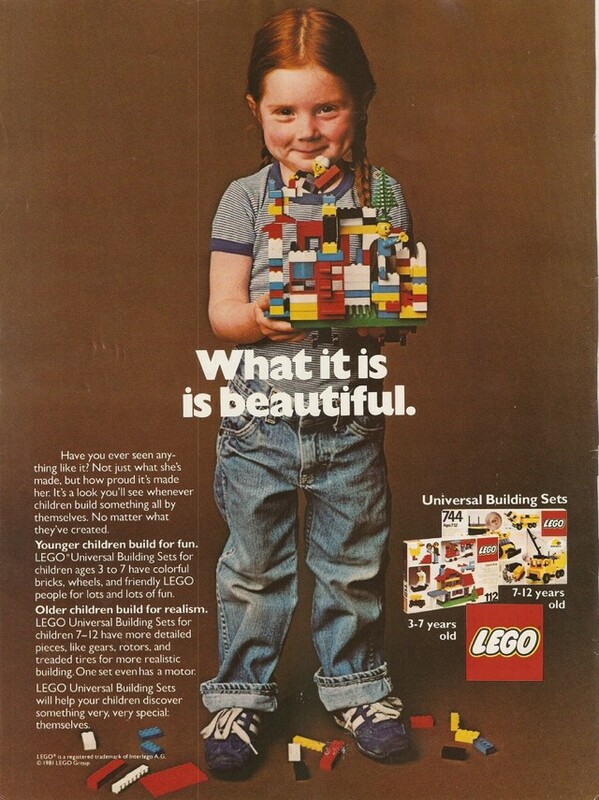 I miss when Lego was just pieces to do what you pleased. Like the girl in the picture. To make things of nonsense that fulfilled a range of challenges (oh no! only 2 grey flat panels left!). The blue, yellow, white, green, red, and grey pieces. the random sets of wheels and rooftop shingles that could be attached to anything. My sister inherited our family's Lego's from the '70's - and while her children have ample "new sets", they still prefer to play with the big mixed box of pieces.